Durasoft are dog toys from KONG with two different textures. These brightly coloured toys float on water. This means that your dog can always find the Durasoft toy at the surface of the water. The pink and blue coloured Durasoft toys from KONG provide plenty of entertainment. 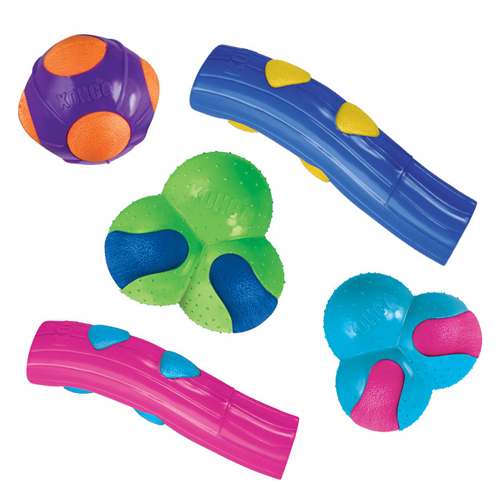 By using various textures, the toy bounces erratically in all directions. This provides an unpredictable factor when your pet plays with it. The squeaker in the toy challenges your dog to play for longer! What's more, these colourful toys also float on water. Have you used KONG Durasoft before? Let us know what you think about this product.